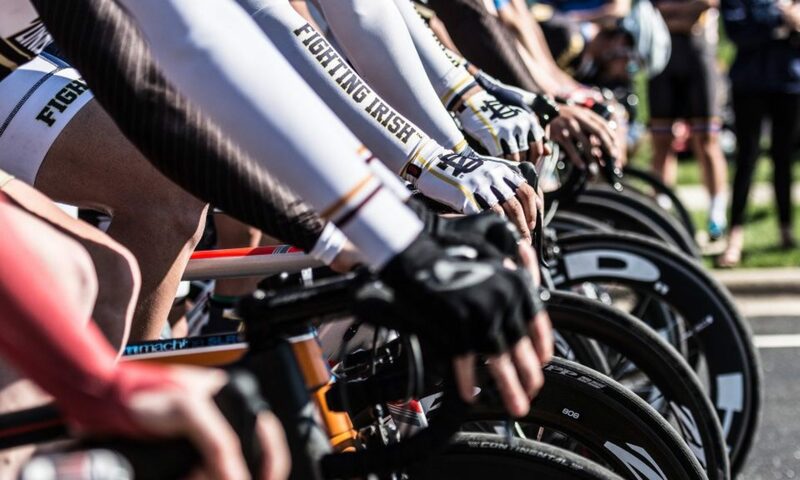 Bloomingdale, IL — On Saturday, November 15, 1st year graduate student Andrew Koch represented the cycling Irish in the collegiate B race at Hilton Indian Lakes. 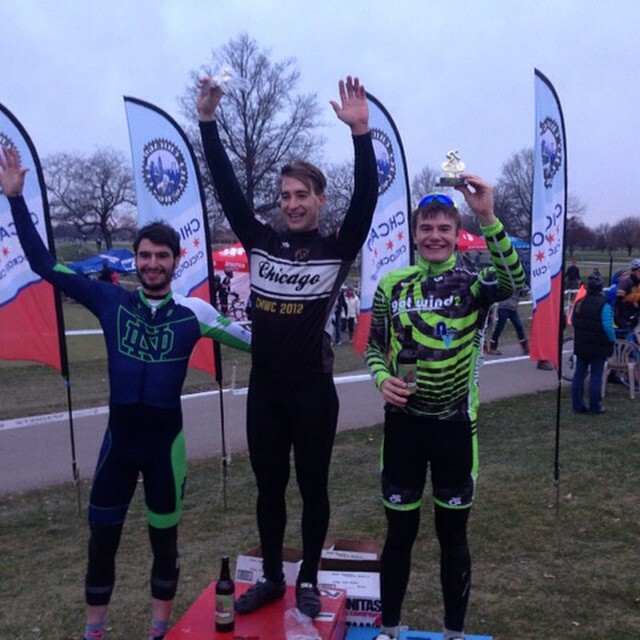 The race was part of the Chicago Cyclocross Cup. Due to good results at previous races, Koch started in the front and never looked back. His win marked the first of the 2014-2015 season for Notre Dame. Despite having already raced, he also competed in the category 4/5 race immediately afterwards and took an impressive 3rd place. Koch is a new addition to the team after graduating from Furman University last year and coming to ND for a Masters in Sacred Music. He will also be competing on the road, starting in the Bs this coming spring. 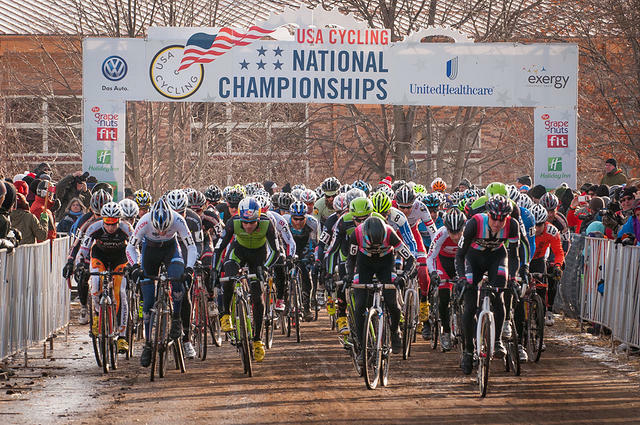 At 9:30 AM on Sunday, January 13, 37 riders from around the country lined up in the start grid for the Division II Collegiate Cyclocross National Championships in Verona, Wisconsin. Though unseasonably warm temperatures earlier in the week had melted the snow on the course, making it increasingly muddy as the week went on, a cold front moved in on Saturday afternoon and left riders to contend with 18 degree temperatures and frozen ruts on Sunday morning. The 2-mile course in Badger Prairie Park wound around soccer fields before ascending a hill several times, each time followed by a harrowing descent made treacherous by the frozen ground and ruts from previous races. Notre Dame’s Douglas Ansel, a graduate student, received a call-up to the second row of the 8-wide starting grid. With a good start, he moved up to sixth position by the time the race moved from the paved start/finish straight to dirt for the first time and quickly thereafter moved up into second wheel leading into the major climb on the course. Over the next several laps, he would remain in second or third position, a few seconds behind the eventual winner. Halfway through the 5 lap / 50 minute race, Ansel was sitting comfortably in second place and making up ground on the technical sections of the course. Two more riders were ten seconds back and the rest of the field over thirty seconds in arrears when he crashed twice on increasingly slippery sections of the course. He slipped back to fourth position but remained in contact with the second and third placed riders until a dropped chain and problem with his front brake forced him to dismount twice to fix his bike and lose thirty seconds. On the final lap, Ansel was still in fourth position but another pair of mechanical issues cost him over a minute and sent him back to 11th place at the finish. of the first 10-mile lap. They would finish in this order. mechanical issue, Carl Josephson managed a mid-pack finish. MurphyKate Montee and Jose Lugo represented Notre Dame at the Purdue Cross-Country Mountain Bike race on Sunday, September 19. MurphyKate placed first in the Women’s A category. After an unfortunate start, she pulled ahead, and won in an exciting sprint finish. Jose had a great start, entering the singletrack in the front of the Men’s C pack, but flatted halfway through the lap and had to walk it in.